At an age where it is not uncommon to spot a person struggling with anxiety or depression, many people have have been turning to alternate methods of natural healing—a popular one being 'animal therapy'. Most of us, at least once in our lives, may have felt the flush of relief and ease around a pet animal: be it your pet cat, a friend's parrot or even a friendly, nameless neighbourhood stray dog. Animal-assisted Therapy(AAT) is a new-age alternate method of treatment intended to help people struggling with mainly stress, anxiety and/or depression. Animal therapy has also proved its mettle in treating psychological, neurological and physical issues, making it a quite holistic and fulfilling treatment available in this era. Some of the most common animals used in animal therapy are dogs, cats, horses, rabbits and even mice. These animals, unlike any pet animals, are professionally trained to provide affection and comfort to the individuals on therapy. "Animal-assisted therapy can foster social competence in patients and increase their emotional involvement during therapy,"says a recent study by University of Basel. Although AAT might seem a relatively new concept in 2019, the use of animals in the intervention of mental illnesses is thought to have been in trend since the middle ages. Lately, in India, too, a handful of organisations are promoting AAT alongside Animal-assisted Activities (AAA). Animal Angels Foundation, a Mumbai-based non-profit organisation, is one such place. Started by Minal Lonkar-Kavishwar in 2003, the team consists of therapy dogs, animal-assisted therapists, pet-parents and volunteers who have been lending service to various special schools and hospitals in and around Mumbai. "We have observed a heightened demand for animal therapy every passing year and lately, we have been trying to widen our reach to other states in India. We have been able to conduct researches and conferences and attend seminars abroad to explore the possibilities of animal therapy and educate people about the benefits of animal therapy," says Aakash Lonkar, director of Animal Angels Foundation. 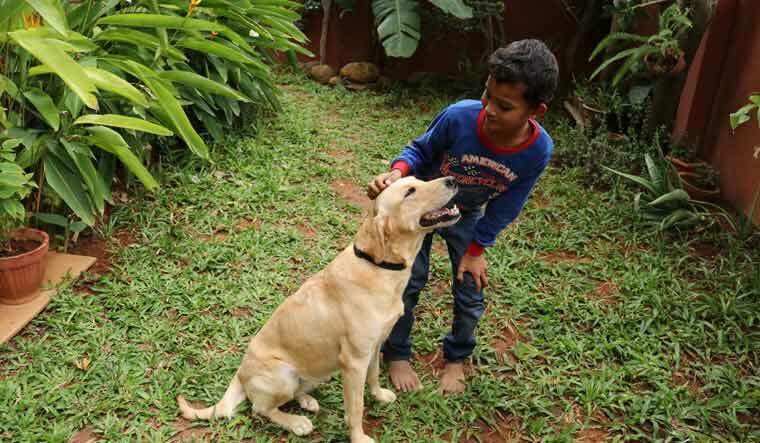 Wag-Ville in Bengaluru is yet another organisation that provides animal-assisted therapy. Their project—Paws and Hooves—is touted as India's first integrated centre offering AAT through both therapy dogs and horses(canine and equine assisted therapy), where both psychologists and physiotherapists work together during the intervention of a case. Subhadra, co-founder of Wag-Ville, says, "My concern for the growth of animal-assisted therapy in India is that people are often skeptic about the treatment, possibly due to their unwanted inhibitions or fears about animals. We have been conducting conferences and lectures on AAT and AAA in and around the country, hoping it would help the people know better about animals and their capable wonders". During animal therapy, people spend time with a therapy animal, most often a dog, for a certain number of days or months while anticipating resilience from the patient. For example, Hippotherapy or Equine-assisted Therapy has been highly effective in promoting 'proprioconception'—the perception of awareness of the position and movement of the body—especially in autistic individuals. Some of the evident improvements seen in patients during the therapy are, ability to care for oneself, improved self-esteem, improved socialising and communication, reduced blood pressure and so on. Among the people who sign up for animal therapy are also patients with chronic neurological impairments such as cerebral palsy, Down's syndrome, autism, multiple sclerosis, ADHD and delayed development of motor skills. Acknowledging the ill-effects of consuming conventional medicines for a long period of time, it is probable that more people will begin to confide in such alternate treatments as animal therapy in the years to come.